We hope you’ve had a great April. Spring is in full bloom on campus. You can read summaries of the articles in this month’s Journal below. To download a complete version of the SIFAT Journal, click here or go to our news page. A Chance to Make a Difference – Today almost 30,000 children under the age of five will die of mostly preventable causes. More than 70 percent of the planet does not have clean drinking water or sanitation. While statistics can be overwhelming, there are solutions that can change this– one community at a time! Our Fall Practicum will teach community leaders self-help skills in the context of Christian community development. You can be a part making a difference in our world by providing full or partial scholarships for our students. Contact Kathy Bryson (brysonk@sifat.org) for information about donating scholarships or finding other ways you can get involved with the Practicum. Reflection on a Deaf Teen Retreat – A group of deaf teens from Dallas, Texas, participated in a SIFAT retreat. These students were given an opportunity to learn about other cultures and themselves during their time on campus. Tom Hudspeth, pastor of deaf ministries at Lovers Lane UMC, wrote a reflection about his experience after participating in the slum experience in our Global Village. Learn & Serve Update – Spaces are still available in our Elementary Learn & Serve session (June 29-July 2). The cost is $150 per person. Weeks 1,4 and 9 are already full! Limited space remains during the other weeks. If your youth group is interested in coming, please register soon. Individuals are also welcome to participate. Learn about the elementary session and how to register on the Learn & Serve site. Contact Learn & Serve director Jamie (waldhourj@sifat.org) if you have questions or need more information. Sarah Trust Fund Update – We have almost reached $130,000. Remember, our goal is $200,000 by November 2008. Please consider giving to this trust fund, so that SIFAT can continue sharing God’s love in practical ways in future generations. SIFAT Remembers: Two Groups that SIFAT Targets – This month, SIFAT cofounder Ken Corson remembers his home in Sapecho, Bolivia, and how living with the poor helped his family understand being poor. He explains the term “mid-pew America” and how SIFAT wants to be a bridge between the First and Two-thirds Worlds to empower Christians to help one another. Practicum Alumni Visit – Jhony Bandela, of Hydrabad, India, graduated from the Practicum in 2006. After returning to India, he realized these were classes his wife, Prasuna Gajula, needed to attend. Prasuna graduated last year, and she returned to India prepared to implement what they learned in Grace & Truth Ministries. Prasuna and Jhony returned to the United States this year to visit churches supporting them and to share the new expansion of Grace & Truth Ministries. Claude Hurtt Joins Staff – If you have called the SIFAT accounting office recently, you may have spoken with Claude Hurtt, our new accountant. Claude has taken the place of Scotty Turner, who returned to Florida with his wife Jane to be closer to his father. We wish Scotty and Jane the best, and we welcome Claude. If you have need to contact Claude, feel free to e-mail him (hurttc@sifat.org). From the Desk of Tom Corson – Tom returned from a trip to the Holy Lands. In this month’s column, he shares how being in the Holy Land, where he encountered the effects of civil unrest and tourism, is vastly different than being His Holy Lands. Tom challenges us to no build stone temples in memory of Jesus’ life, but rather, to make our own bodies His temple where we get involved and act out His command of loving our neighbor. Don’t forget that you can donate to SIFAT online. Do you want to find out about ways to get involved with SIFAT? Click here. Do you want to receive the e-Journal and other e-mail updates? Send a blank e-mail to info@sifat.org with the word SUBSCRIBE as the subject. Our e-Journal was sent out yesterday. Do you want to be on our e-mail list? If so, send a blank e-mail to info@sifat.org with the subject line “subscribe”, and you’ll be added. If you received the e-newsletter, the link to download the Journal has been corrected below. Wow! A lot has been happening on our international campus, as well as in our international projects. You can read summaries of the articles in this month’s Journal below. To download a complete version of the SIFAT Journal, click here or go to the news page of our website. Harvesting Rice, Seeing Change – Rachel Parsons, director of our boarding home (internado) in Ixiamas, Bolivia. shares about the school year. As of March 10, 40 students are living at the internado. Recently, they have been harvesting rice for the coming year. Rachel also shares a story about Alex, one of the students who lives at the boarding home. Through Alex, Rachel has been able to see change and the positive effects of being able to go to school and live at the internado. Short-term Missions in 2008 – Peggy Walker, our international team coordinator, is excited about the 2008’s mission teams. With 688 people scheduled to go on 23 teams to Ecuador, we hope to be able to almost complete the church building attached to Mama Yoli’s Daycare Center ahead of schedule. Eight teams will travel to Ixiamas and Quesimpuco with 150 team members to begin working on new projects in both villages. In Ixiamas, interns and team members will continue building the girl’s dorm mentoring the young people in the internado. In Quesimpuco, work will begin on the footbridge proposed last year to cross the Chayanta River, providing much needed year-round access for the people across the valley. SIFAT Remembers: The Integrated Gospel – Ken Corson, cofounder of SIFAT, continues his column with an experience he encountered while representing SIFAT at a seminary. He explains the reason an integrated Gospel is needed in ministry. Sarah Trust Fund Update – The Sarah Trust Fund reached $123,430 during March. Remember, we are trying to reach $200,000 by November 2008. Are you interested in matching funds for this trust, donating stock or other planned giving? If so, contact our executive director Tom Corson, corsont@sifat.org. Bridge Update: Honduras trip – In late February, Tom and two members of Auburn UMC’s Quesimpuco team traveled to Honduras to meet representatives of Bridges to Prosperity and see a footbridge being built. Bolivar Sanga, a SIFAT graduate and bridge engineer, was in Honduras receiving training from Bridges to Prosperity. 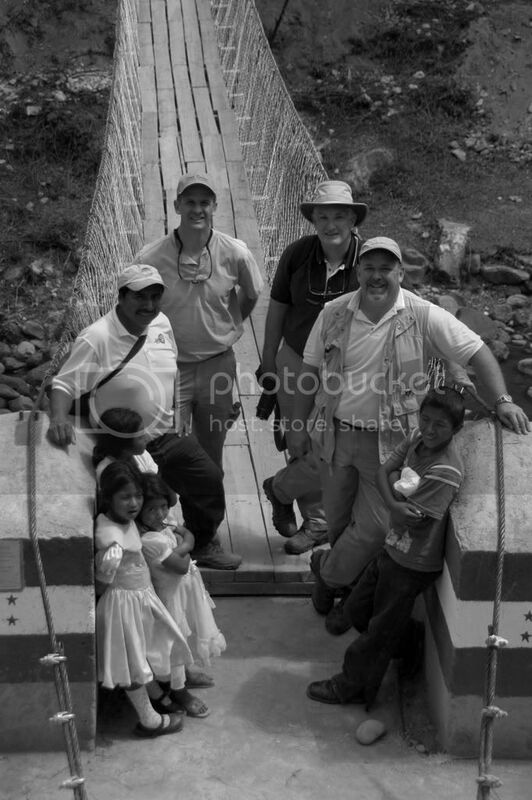 This photo (left) shows the team at the Honduran bridge. The bridge in Quesimpuco will be about three times as long as this bridge. Partnership for Clean Water – SIFAT is partnering with Water for All International to learn an appropriate technology that can make clean water a reality for many in the world. Our intern, Addison Shock, has spent time learning this simple well-drilling technology that uses manual labor instead of motors. Addison and WFA will work together to drill a well at our internado in Ixiamas, and we plan to follow WFA’s model of creating water clubs to be able to implement this technology to bring clean water to all the homesteaders in the Ixiamas area. Sure, I can do that! – Volunteer Ellen Harper is profiled in this quarter’s volunteer spotlight. Ellen works with the CARES program, mainly, but has also helped decorate for International Night and Team Leader Training, as well as with office tasks. Our staff counts on Ellen and her usual response of “sure, I can do that!” when we ask her to help us. Quieres pintar? – Do you want to color? Holly Bolinger used this simple phrase frequently during her recent trip to Ecuador with the Auburn University Women’s Healthcare team. Holly leads our local County Road 88 ministry, and she worked with the Bible school part of the team. 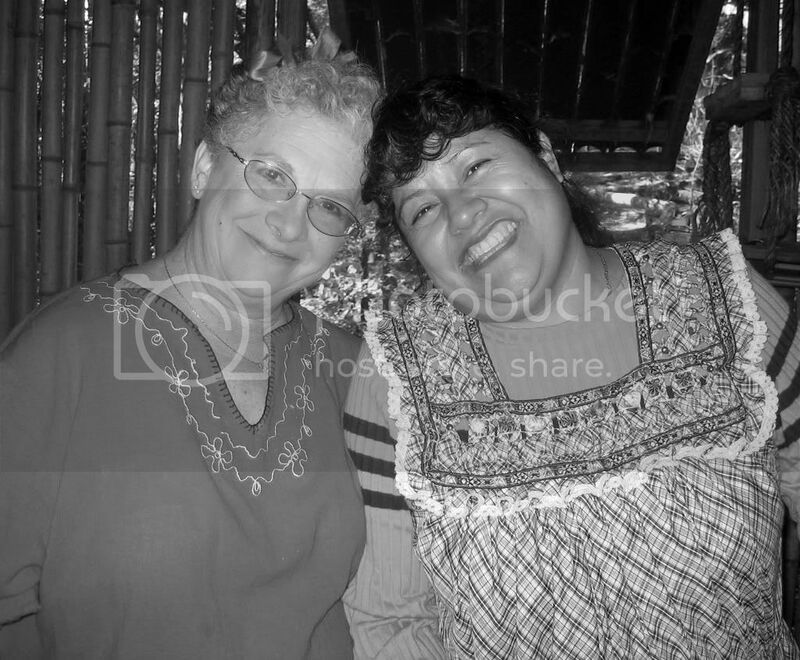 In this article, Holly shares about how God opened her heart to the community of Carmen Bajo. From the Desk of Tom Corson – This month, Tom writes about the recent board meeting and how SIFAT still follows Matthew 28:18-20 by sharing God’s love in pracitcal ways. He says that our responsibility is to model the love of Christ in all we say, think or do to share His love, peace and joy.